This is the first of what I hope will be a monthly round-up post detailing my sewing and fabric purchases. I'm hoping that this format will enable me to get most, if not all, of my sewing projects up on the blog, regardless of whether they get a dedicated blog post, since I'm hopeless at keeping notes in any other format. I'm also going to tally my fabric in/out numbers. I don't have any particular buying or stashing or de-stashing goal, but I aim to be more purposeful in my fabric purchases while also using up some of my stash. Last weekend I downloaded the update of the free Plantain t-shirt pattern. I've made the pattern a few times before, but I'm up a couple sizes since then, so I decided to use the new pattern and refit it from scratch. Since making my long wool Blackwood cardigan, I've been on the hunt for another sweater knit fabric. I was having trouble committing to one online because I couldn't feel the fabric through my computer screen. But when I was at Joann's last month, looking for grosgrain ribbons for my girls' Nutcracker performances, I found this pretty cream-colored faux-cable knit. It is a polyester/lycra knit, something I generally stay away from, but it felt very nice in the store aaaaand I had a coupon, so I bought 2.25 yards. I haven't been able to find it online, but as it turns out, I can't really recommend the fabric anyway. 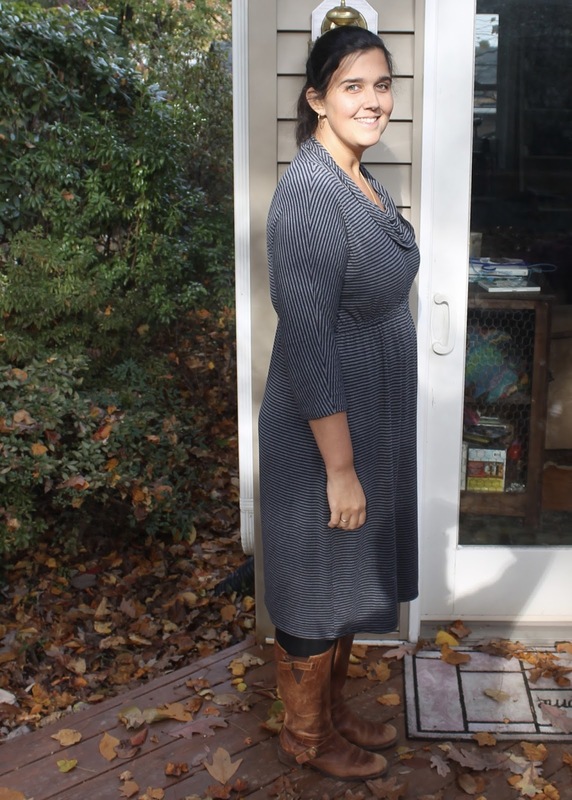 I happened upon McCalls 7353 sometime last summer, and put it on my list to buy during the next pattern sale at Joann's. 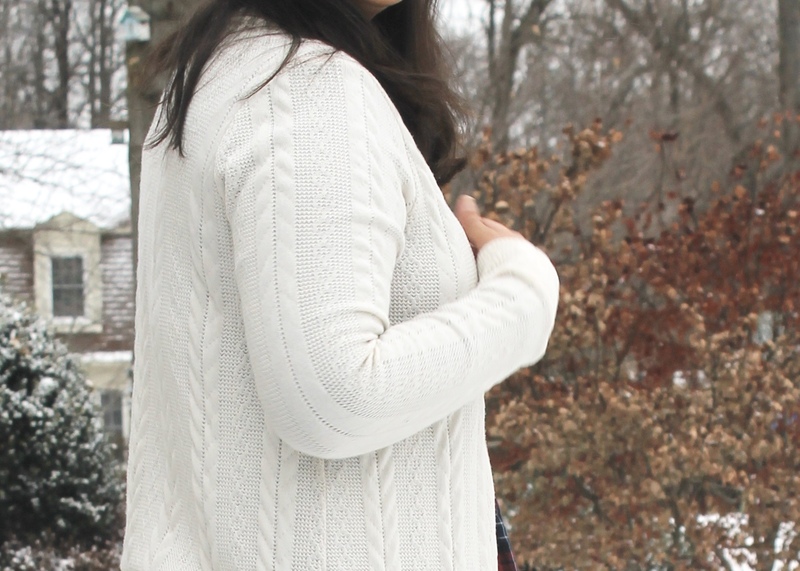 I was drawn to the dolman sleeves, waistband and cowl-neck of View C. There aren't a lot of reviews out there for this pattern, but one of the ones I saw on Pattern Review weren't glowing. In particular, they noted the very excessive amounts of ease included in the pattern. I wasn't put off by the reviews, and I am glad I read them before buying the pattern, because I ended up purchasing the smaller size range rather than the larger one. I spent a good chunk of time in 2016 laboring over flower girl dresses for my brother's wedding. 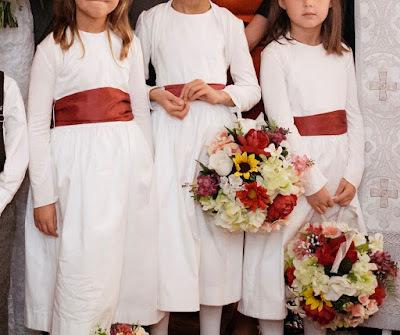 It was always my intent that these dresses be worn more than once, but somehow they didn't get pulled out for Christmas or Easter following the wedding. You wouldn't know it by reading my 2017 statistics post, but I am actually drawn to slow fashion and minimalism. I read a lot of blog posts promoting slow fashion and find myself vigorously nodding my head at the idea that stashing tons of discount fabric and sewing a garment a week is just a different form of fast fashion. But I also enjoy sewing too much to limit myself to a project a month. I don't have any guilt about the 46 garments I sewed myself last year because I really did need that much clothing, and I wear the overwhelming majority of the clothes I sewed frequently. But going forward, assuming my proportions don't change too much, does my wardrobe really need 46 additional garments every year? I don't think so. As it turns out, the Itinerant Family will be experiencing some big changes in 2018, and as a result, I've been handed a ready-made set of sewing goals. We are moving to Colombia in a few months! I'll have no choice but to sew fewer garments this year as I'll be separated from my machines for about three months during the transition. We'll be in Bogota for two years for my husband's work.